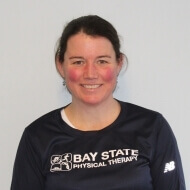 Kerry is a Senior Physical Therapist at Baystate Physical Therapy in Scituate. Kerry has been treating since 2000 as an outpatient physical therapist and at Baystate since 2006. Kerry sees a variety of patients including young athletes, work related injuries, recreational injuries, as well as surgical recovery. Kerry most enjoys the variety of patients she sees and her goals are to help the patient return to full function with care, guidance, and personalized treatment. Kerry is a runner, and supports many local fundraisers. She also participates in boot camp and indoor soccer. She enjoys coaching her two young children in Scituate Town Soccer.